We have compiled a list of non-VA resources and websites that might be useful to student Veterans and those who support them. These are non-VA links, and so we do not endorse and are not responsible for the linked content. We can update links and add more. Just email us with your feedback. State Approving Agencies - State Approving Agencies, including mailing addresses and telephone numbers. Information on state specific National Guard Programs and benefits via the National Guard Recruiting Website. The National Archives - Request copies of your military records here. Department of Labor - A site designed to make it easier for veterans to obtain civilian job credentials based on military training and experience. 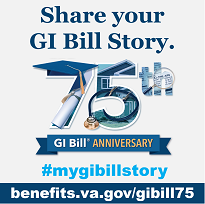 GI Bill Regulations - Cornell Law School's collection of United States Code Title 38 Regulations which govern the GI Bill programs. Military Spouse Resource Center - Find resources on employment and education for military spouses, community information and more. DOD Voluntary Education Program - This program provides off-duty civilian high school, vocational-technical, undergraduate and graduate educational opportunities to U.S. military personnel worldwide. These services are provided through the respective Services and their local education centers. Discharge Upgrade Information - Information on how to contact your service Board for Correction of Military Records to correct or update any information relating to your military service. Army/American Council on Education Registry Transcript System (AARTS). - Get a transcript translating your formal military education and job experience into civilian language, also includes college equivalent credit recommendations. Community College of the Air Force - CCAF: The foremost occupational education institution -- preparing the world's best expeditionary-minded air, space and cyberspace enlisted leaders. U.S. Department of Education Guide to Federal Student Aid Programs - This website lists many different types of student aid available and allows users to find aid tailored to their specific circumstances. National Military Family Association - This site has useful information for military families as well as a scholarship program for spouses of military members. MilitaryScholar.org - This site offers a scholarship for children of military members. Tillman Military Scholars Program -The Pat Tillman Foundation’s Tillman Military Scholars program supports our nation’s active and Veteran Servicemembers and their families by removing financial barriers to completing a degree or certification program of choice. The scholarships cover not only direct study-related expenses such as tuition and fees, but also other needs, including housing and child care. There are several Veteran Service Organizations (VSOs) that provide free, professional assistance to veterans and their families. Many organizations have service officers in every state that can provide answers to questions about education benefits, federal student loans and credit transferability. To find a Veteran Service Officer near you click on the following link: https://www.va.gov/vso/. Student Veterans of America - An organization dedicated to creating an environment that fosters a smooth transition into institutions of higher education for student veterans while maintaining an open and progressive dialogue among student veterans nationwide and their counterparts in their respective educational institutions. American Council on Education - ACE evaluation teams provide clear guidelines to interpret and recommend credit for formal service-school courses, demonstrated proficiency in military occupations, and college-level tests. Council for Higher Education Accreditation (CHEA) -The CHEA Database of Institutions and Programs Accredited by Recognized United States Accrediting Organizations provides the largest and most comprehensive Web-based listing of accredited institutions and programs in the U.S. The database is maintained on the CHEA Website at http://www.chea.org/search/ and updated regularly. Users of the database can easily find whether an institution or program is accredited, the organization that has awarded the accreditation, and where the institution or program is located. For more detailed information, links to all institutions, programs and accrediting organizations are provided as well. NOTE: VA approval should NOT be inferred just because a program or institution is on this listing. America's Job Bank - Post your resume to reach employers nationwide. America's Career Info Net - Information source for Career Decisions, National and state-by-state labor market data. Employment trends, wages and more. College Navigator - This website from the U.S. Department of Education helps you find a college that fits your needs. It contains detailed information on public and private colleges throughout the nation. VA Guard & Reserve Page - This website shows all the benefits VA offers to National Guard and Reserve members. Handout: Federal Interagency Academic Credentialing for Service Members Task Force – Comprised of representatives from VA and the Departments of Education and Defense, the Task Force is dedicated to increasing awareness of promising practices and policies that promote awarding of academic credit at institutions of higher education for prior military training and experience. Read more to learn about how this will impact your institution and what you can do to help support this work.